Defi-Link Advance CR Gauges are the next generation system that adopted the interactive communication. The Defi-Link ADVANCE system allows gauges and displays to be attached to the ADVANCE control unit with a single “DAISY CHAIN” wiring system. Gaugess, displays, and ADVANCE Control Unit are equipped with microcomputers. Distant gauges can be operated at hand. The system is also designed to allow all sensors to be attached to the ADVANCE control unit, so that gauges can be mounted separately without the need for multiple tubing or wiring to each gauge. The product of Defi-Link ADVANCE SYSTEM cannot be connected with the product of Defi-Link SYSTEM. It is not compatible with the product of Defi-Link SYSTEM. Interactive communication advanced system is implemented. Flat glass and precise graduation scale give more needle accuracy and high visibility. Gauges can be controlled from distance with the included switch unit. Opening and closing modes can be selected from 2 variations. The installation of additional gauges is easy. Just connect it with theother two gauges and attach the wire to Advance Control Unit. 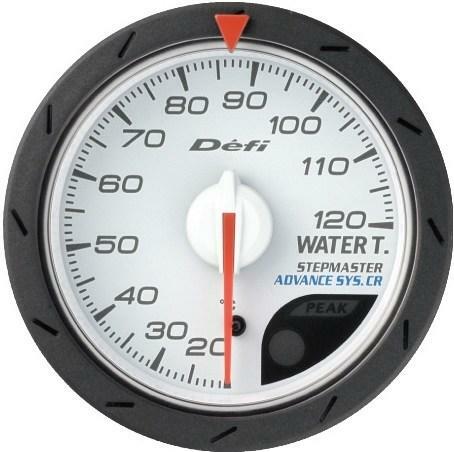 The outer edge of the gauge illuminates in red at night. The needle pointer driven by original stepping motor has a smooth instantaneous response to rapid acceleration of high performance vehicles. The microcontroller calibrates up to 270 degree angle in 3027 – 4600 segments (0.088°- 0.059°), and provides accurate vehicle information. Self-diagnosis system turns the warning LED on to indicate any wire disconnection, short circuit and serial communication errors. Warning by buzzer sound when the warning LED is on (buzzer sound can be turned on / off). Peak value and warning value during driving are stored. Driving data can be stored and replayed up to 3 minutes. A mounting bracket, meter cup, regular position bezel are provided with this product. With both fuel pressure gauge and turbo installed, differential pressure can be monitored on the fuel pressure gauge screen.